In the ancient, mystical past when an idyllic Atlantis-like civilization flourished, its people with exceptional powers could build giant stone structures like the Pyramids, and transform elements such as sand to stone and metal to gold with concentrated energy of the mind. This utopian Atlan Empire is rocked when one of its most preeminent Masters rebels and seeks to subvert the ideals of Atlan society. Roaming the countryside in a black robe, misusing his powers on innocent people, he becomes known as the dreaded Dark Master. On a distant and isolated island on the fringes of the Atlan Empire, a young girl named Rhuna comes of age when she meets a man from Atlán and learns that her father was an Atlan Master who was killed in his attempt to destroy the Dark Master. 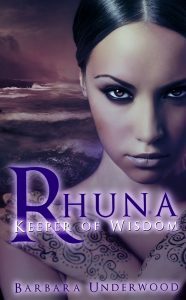 Journeying across oceans and ancient worlds, Rhuna learns to master her inherent mental powers, transforming elements and summoning visions by means of the Gazing of the Waters. Unlike her peers, however, Rhuna discovers she has an extra power, namely the ability to summon visions mentally, without incantations or powders. When the Dark Master’s activities become a threat to the peaceful Atlan Empire, the Atlan Masters come to realize that they cannot defeat him without Rhuna’s special visionary powers to observe the Dark Master’s activity and whereabouts. The first book in this extraordinary Urban Fantasy series lays the foundations of the Atlan Empire and Rhuna’s world, and even when the Dark Master appears to have been defeated, secret and sinister powers continue to threaten the ancient Utopia. Born and raised in Sydney, Australia, Barbara has loved to write since early school days, and has now combined her travel experiences and interests in history, folklore and people in this fantastic adventure. She now resides in Tumut, New South Wales, with her husband and their dog, Cisco.